Shu Uemura Cleansing Beauty Oil: my new best friend…seriously! I attended the incredibly informative Handpicked Media Gets Social event last Monday, and picked up some brilliant blogging tips which I am hoping to put into practice over the coming months. The goody bag that all attendees received on the day included a full size Shu Uemura cleansing oil. Having always viewed Shu Uemura as a high end brand, I was rather excited at finally being given the chance to try one of their products, especially as oil cleansers in general have received quite a lot of hype recently. It nicely leads me to my surprise discovery about this particular cleanser: it is amazingly brilliant at removing make up, whilst being very ‘non-abrasive’, i.e. leaving your skin feeling incredibly nurtured and moisturised. The way to use it is to 3 to 4 pumps of the oil into your hand (although I actually find that two is plenty); smooth it over a dry face and then apply water to your face to emulsify it. The picture to the left gives you an idea of how the oil looks once emulsified. The final step is to simply rinse off with water. Brilliant, and so simple. It’s perfect if, like me, you find the whole removing make up last thing at night thing a bit of a faff. Although I would usually be hastily reaching for a moisturiser to deal with tightness that I get after rinsing my face, this particular cleanser makes that final step slightly less necessary, and will certainly save you having to apply too much moisturiser. 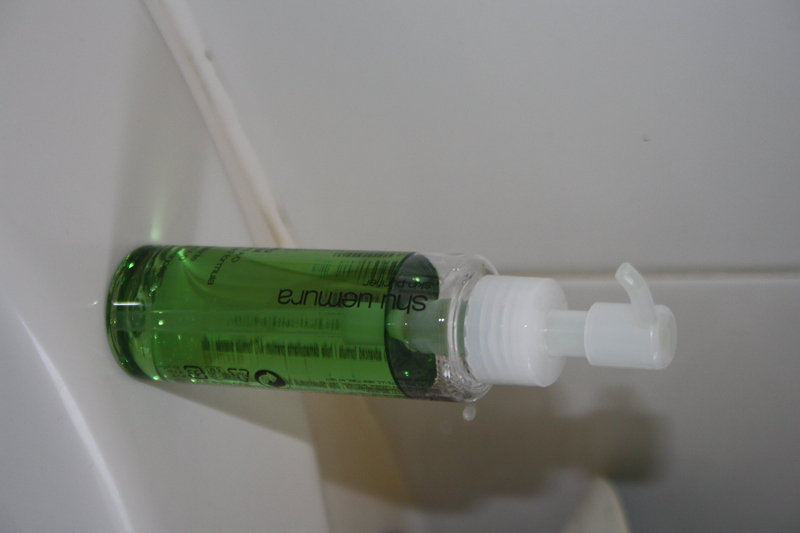 The 150ml bottle shown in the picture usually retails for around £28. I’m not sure how this particular cleansing oil would work on a different skin type, but would definitly recommend it for those who have a drying skin. Almost a week in and I am already hooked. I’d be very interested to know if anyone has tried any other Shu Uemura products and what they think of them. Great review, I’m looking forward to trying the one in my goody bag now. Thanks. I really liked it. Let me know what you think.